“Behold, I will send you Elijah the prophet, before the coming of the great and awesome day of HaShem” (Mal. 3:23). Jewish tradition teaches us that Elijah is a messianic figure who will usher in Mashiach and the Messianic Age. This is purposely fitting at this season because Passover is our reliving and retelling of our redemption from Egypt. Both Jewish tradition and the New Testament portray Elijah as representing the coming of messianic redemption. That is why the figure of Elijah is so connected with Passover. Passover today commemorates our connection with not only our physical redemption from slavery, but our spiritual redemption as well. “And it is he who will go as a forerunner before Him in the spirit and power of Elijah, to turn the hearts of the fathers back to the children, and the disobedient to the attitude of the righteous; so as to make ready a people prepared for the L-rd” (Luke 1:17). So John the Immerser was a partial fulfillment of this week’s special Haftarah reading from Malachi 3:23 in preparation for the incarnation and revelation of Yeshua the Messiah. Yet, the role of Elijah is still not complete, for there is an expectation that Elijah himself will yet return ahead of our glorious Mashiach. This is the reason Elijah is referenced so often in Jewish tradition, especially during Passover. 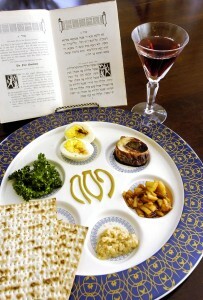 During the Seder there is a whole place setting (or in some homes, simply a cup) that is specifically set aside. It is left untouched in the messianic hope that each year we will open the door during our Passover festivities, and welcome in Elijah, who will in turn usher in the return of our Messiah. May we all merit the return of Mashiach and see that day fulfilled speedily and soon! This entry was posted in Uncategorized and tagged Holidays, Passover, Shabbat, torah. Bookmark the permalink. What do you think about Elijah (and Moses) showing up at Yeshua's transfiguration? How do you think ot fits in? Much love! Shabbt Shalom! Hope you're doing well! Good question. The obvious connection is both of their central roles in Passover. Another may be their being symbols of redemption (Moses as the redeemer of Israel from Egypt, Eliyahu as the forerunner to Mashiach). And Yeshua is obviously the greater redemptive figure and the one the other two usher in. However, beyond that I'll have to give it a little more thought …What are your thoughts? Today is a gift from Elohim our Our king and heavenly father. Have a joyful day in HIM.